WASHINGTON, D.C. -- Americans' views of U.S. relations with Mexico are at new lows with 72% of Americans saying Mexico is an ally (27%) or a friend (45%) of the U.S., the lowest point in Gallup's nearly 20-year trend. Twenty-six percent say the country is an enemy (20%) or unfriendly (6%) toward the U.S., the highest percentage historically. These data come from a June 2-8 Gallup survey asking Americans about U.S. relations with each of 12 different countries. The survey was conducted as U.S.-Mexico relations continue to be fraught with difficulty and marked by criticism from President Donald Trump concerning immigration and trade. Trump has made the construction of a wall to halt illegal immigration between the U.S. and Mexico a key policy of his administration. Gallup has asked Americans their views on U.S.-Mexico relations four times since 2000. For the first two readings, in 2000 and 2001, nearly nine in 10 Americans (88%) said the country was a friend or ally. 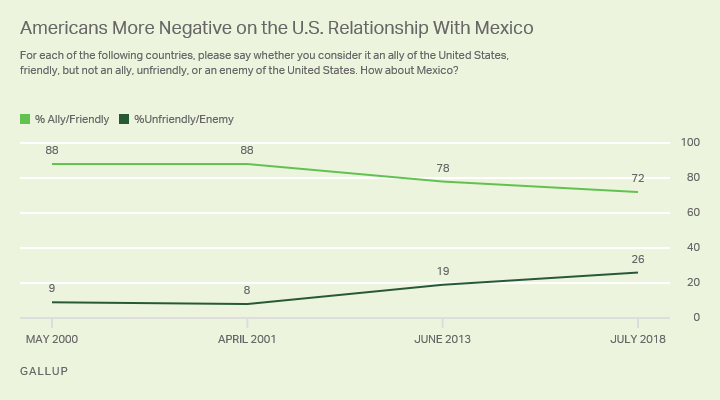 However, in June 2013, the percentage of Americans saying Mexico was a friend or ally fell 10 percentage points. Americans' views of U.S.-Mexico relations may have soured at that point over views that drug cartel-related violence, which was spiraling at the time, would spill over across the border. Opinions on the relationship have continued to become less positive, with 72% now saying Mexico is an ally or friend and 26% an enemy or unfriendly. Not surprisingly, given Trump's criticism of Mexico, Democrats are more positive about U.S.-Mexico relations. Thirty-eight percent of Democrats say Mexico is a U.S. ally and 40% view the country as friendly, but not an ally. This contrasts with the 17% of Republicans who believe Mexico is a U.S. ally and 49% who view the country as friendly. For each of the following countries, please say whether you consider it an ally of the United States, friendly, but not an ally, unfriendly, or an enemy of the United States. How about Mexico? There has been a divergent trend in views of Mexico as an ally of the United States between the current reading and 2001, with fewer Republicans seeing the country as an ally, while more Democrats do so. In 2001, there was a modest difference of five percentage points between the two partisan groups on perceptions of Mexico as a U.S. ally. That has since grown to a 21-point gap in the current reading. Mexico ranks behind several countries that clear majorities of Americans see as allies or friendly toward the U.S. Eighty-five percent or more say Great Britain, Canada, France, Japan and Germany are allies of or friendly toward the U.S., likely reflecting the long alliances with these countries. For each of the following countries, please say whether you consider it an ally of the United States, friendly, but not an ally, unfriendly, or an enemy of the United States. How about--? Americans' attitudes concerning relations with Saudi Arabia and China are more mixed. Fifty-three percent in the U.S. see Saudi Arabia as an ally or friendly, compared with 43% who say it's an enemy or unfriendly. Americans' attitudes about China are similar, with 55% saying the country is an ally or friendly and 44% identifying it as an enemy or unfriendly. 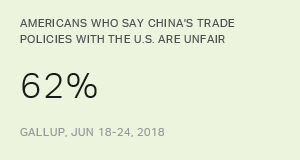 The majority positive view of China on this measure is in contrast to the 62% who say China's trade policies toward the U.S. are unfair. The 57% of Americans who consider Canada an ally is down slightly from 61% in 2013, perhaps because of Trump's recent criticism of the country's trade policies. There has also been a substantial improvement in Americans' assessment of relations with Germany, with the percentage viewing the country as a U.S. ally having risen to 45%, up from 27% in April 2003, the last time Gallup asked about the country. Americans' opinions of France-U.S. relations have also improved from a low of 18% who saw the country as an ally in April 2003 to the 49% who do so now. Trump has routinely criticized Mexico, infamously referring to Mexican immigrants as criminals in a June 15, 2016, speech during his election campaign. Trump has also imposed tariffs on Mexican goods and routinely criticizes the country for its alleged failures to do more to stop the smuggling of illegal narcotics and prevent immigrants from illegally crossing the U.S. border. Americans' attitudes on U.S.-Mexico relations had taken a negative turn in 2013. But this steady drumbeat of critical rhetoric, as well as his vow to build a border wall and have Mexico pay for it, appears to have further contributed to worsening assessments among Republicans, which are largely responsible for the decrease among Americans overall since then. Americans' increasingly negative attitudes toward U.S.-Mexico relations could potentially have an impact on the ongoing renegotiation of NAFTA. Given these views, Americans may be more willing to support a tougher stance in these negotiations, despite the potential impact on trade with Mexico, the United States' third largest trading partner. 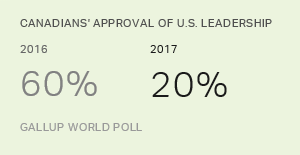 Results for this Gallup poll are based on telephone interviews conducted July 2-8, 2018, on the Gallup U.S. Poll, with a random sample of 1,291 adults, aged 18 and older, living in all 50 U.S. states and the District of Columbia. For results based on the total sample of national adults, the margin of sampling error is ±3 percentage points at the 95% confidence level. All reported margins of sampling error include computed design effects for weighting. Americans continue to view North Korea as either an unfriendly nation or an enemy as opposed to a friendly nation or ally, though fewer now than in 2013 say it is an enemy. Sixty-two percent of Americans say China's trade policies with the U.S. are unfair, while majorities say the policies of Canada, Japan and the EU are fair.